BOCA RATON, Fla. - April 16, 2018 - PRLog -- -- Following his unveiling of a Glasstudio Borowski exhibition at Flamingo Gardens in Davie/Fort Lauderdale, Sklar Furnishings hosts Wiktor Borowski for a rare, up-close-and-personal afternoon for art lovers of and longtime fans and collectors of the Borowski artistic glass masterpieces and its three collections Art Objects, Studio Line and Outdoor Objects on Sunday, May 27 from 12 Noon to 4 pm.Borowski will meet, greet and sign Glasstudio Borowski sculptures previously acquired at Sklar Furnishings and those purchased during the afternoon at the contemporary/modern furniture showroom and design center located at 6300 N. Federal Highway in Boca Raton. Wiktor Borowski, the owner of Glasstudio Borowski, shares that his family has long contributed significantly to the Studio Glass Movement, a young and exciting art form that has been in continual development and of increasing importance since the 1960s. Citing that by the 1970s his father Stanislaw Borowski (born in 1944 in Moutiers, France) had already gained international respect and recognition with his engravings and sculptures, Wiktor Borowski shares that now Borowski glass manufacture ranks among the most acclaimed artistic glass studios in the world. Numerous masterpieces created by Wiktor's father and brothers, Pawel and Stani Jan Borowski, are now exhibited in renowned international galleries, private collections and museums such as the Corning Museum of Glass in New York, certainly the most important Glass Museum in the world. "As our clients shop our exclusive furniture lines they customize for their homes, they are immediately smitten by Borowski's brilliant colors, magical whimsy and ingenuity they spot throughout our showroom," said Rick Howard, co-owner and president Sklar Furnishings that has long featured an extensive, varied array of Glasstudio Borowski exclusives. "Those who visit love how each Borowski piece can be become part of their daily lives, as eye-catching, purposeful home accessories as fruit bowls, vases, candle-holders and lamps or as captivating focal points in gardens or on terraces." 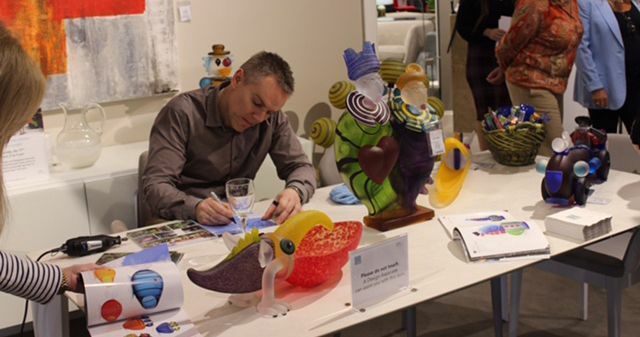 When asked why international buyers and collectors value Borowski masterpieces and studio artistic art glass, Borowski shares that "there is the completely emotional aspect: an often quite spontaneous excitement at the wealth of ideas, the explosion of colours, this zest for life that these works embody. Every single one of them – be it a masterpiece, one of a collection or edition – is a quite special, unmistakable, life-affirming art concept, unique to Borowski, and is hard to match. It is therefore all the more fascinating that each and every one of these light, bright and colourful unique pieces has undergone such a complex production process." Borowski adds that it is "because it is an old and demanding skill that only very few manufacturers today possess, I believe that is exactly the attraction for collectors and art-lovers – this special quality: the unique mixture of craft skills and joie de vivre! No other material plays with light, colour and form to such an extent, or appears to forge such a natural connection with its environment. Even its production seems to be almost magical – from sandy raw materials to crystal clear beauty." "They embody our artists' wealth of ideas and the craft skills of our glassmakers in equal measure," continued Borowski. "Each piece in the collection has been worked with great love and care and meets the highest quality demands. With Art Objects, Studio Line and Outdoor Objects we can pass on our fascination for glass." Stanislaw Borowski (http://www.borowski-studio.com/artists/stanislaw-borowski/) laid the foundation for today's Borowski Glass Manufacture for hand-blown and hand-crafted glass. Initially he created his own special ideas in a garage. Using almost forgotten techniques for engraving on cameo glass, self-made tools and new art concepts, Stanislaw Borowski knew just what he wanted, and his extraordinary engravings and sculptures soon received international acclaim. This led to exhibitions in Germany – Kassel, Hamburg, Düsseldorf – as well as in the USA, the Netherlands and Japan. In 1990, together with his two eldest sons, Pawel and Wiktor, he founded the Glasstudio Borowski, and since 1993 these two sons have taken over the management. Pawel Borowski (http://www.borowski-studio.com/artists/pawel-borowski/) runs the artists' studio and the glass manufacture, while Wiktor Borowski is in charge of the management of the Glasstudio Borowski. Sklar Furnishings store hours are Monday through Saturday from 10:00 a.m. to 6:00 p.m., Sunday from 12:00 Noon to 6:00 p.m. and evening hours are available by appointment. For more information, visit www.sklarfurnishings.com or call 561-862-0800.